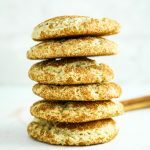 This gluten free snickerdoodle recipe creates the perfect texture in a cookie – crunchy on the outside and chewy inside! 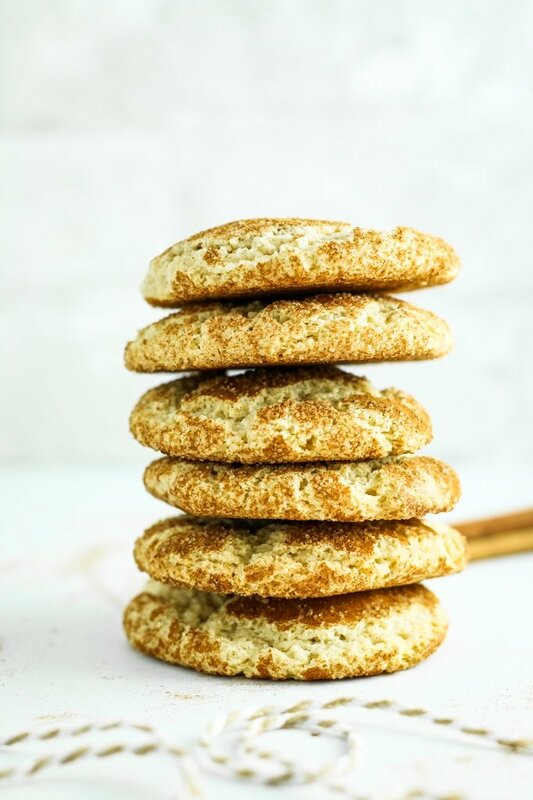 We partnered with our friends at Bob’s Red Mill to create this gluten free snickerdoodle recipe. Thank you for supporting the brands we love! Well, friends, the holidays are coming. We just breezed right by Halloween, didn’t we? Now it’s time to start planning Thanksgiving dinner, playing Christmas oldies, and finding gifts to put under the tree. Even though this season makes me feel all warm and glowy, I know it’s not like that for everyone. This can be a dark time of the year for so many people. People dealing with loss, military families, people without families, people living away from home, people who don’t have homes – the list goes on. Colorado Springs has an especially large homeless population. There’s not enough shelter space. There aren’t enough resources. There isn’t enough funding. Everyone knows the issue exists but very few people seem to know how to address it. Since moving here last year, I’ve found myself wondering: “how can I help?” I can’t donate money to every organization and I can’t invite everyone in for Thanksgiving dinner or for Christmas. But I can bake. And baking is a start. 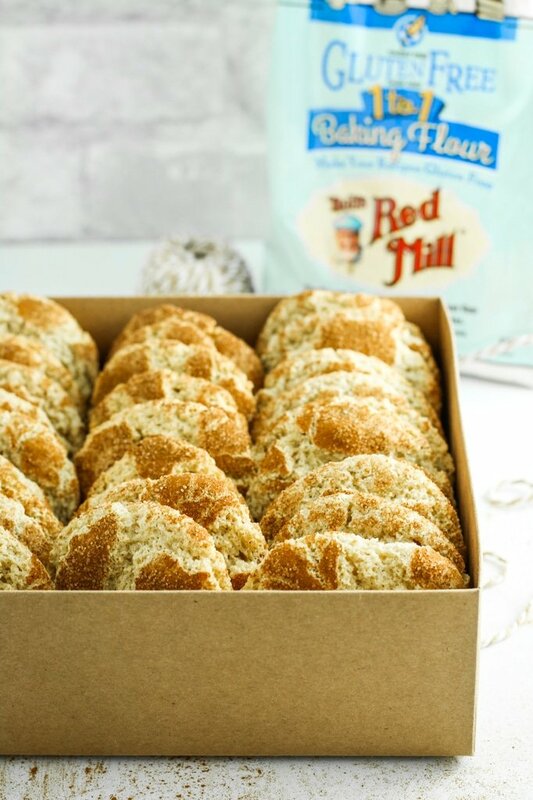 This holiday season, Bob’s Red Mill is encouraging us to bake joy for others. For our friends, for our family, for strangers. It’s a simple gesture, yes, but a little can go a long way. Baking is good for your soul and that means it’s good for the world. After we took these pictures and while the snickerdoodles were still warm, we hurried them over to the Springs Rescue Mission at check-in time. It was a cold day and I hope that the cookies at least warmed up a few bellies. For these snickerdoodles, we used Bob’s Gluten Free 1-to-1 Baking Flour because I wanted you to be able to make these for anyone and not have to worry about leaving out someone who has a food allergy. You can use this as a substitute for all purpose or wheat flour in your favorite cookie recipe with equally awesome results! Bob’s was kind enough to hook us up with a coupon for $1 off any of their products – making it easier for all of us to spread the love this holiday season. What are you baking right now? Do you have an awesome pumpkin pie recipe that you’re bringing to Thanksgiving? Or do you have a soft and chewy sugar cookie recipe that you bake every year? Tell me about it in the comments! 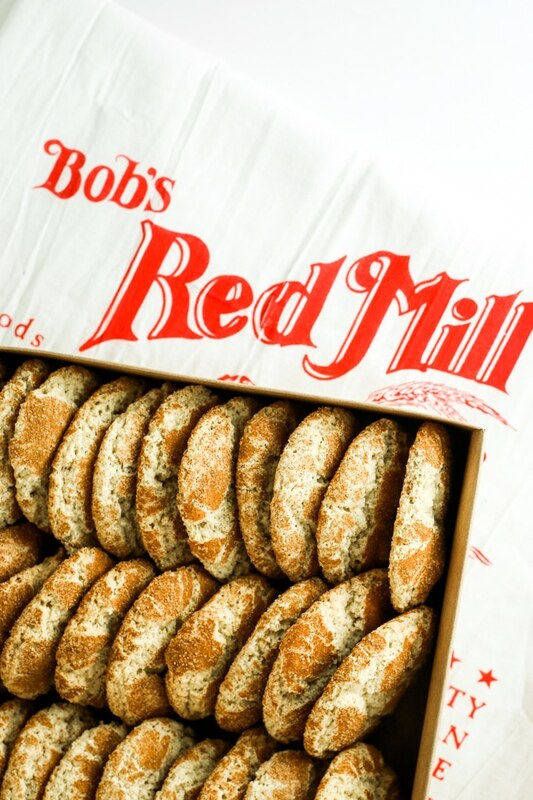 This is a sponsored post written by me on behalf of Bob’s Red Mill. As always, all words and opinions are my own. In a large bowl, combine 1 1/2 cups of sugar and vegan butter. Using a hand mixer, beat until light and fluffy. Add vanilla and eggs and mix until well-combined. Add flour, cream of tartar, baking soda, and salt and mix again. The batter should be firm and sticky. In a small bowl, combine 2 Tablespoons sugar, cinnamon, and nutmeg. Mix together using a fork. Scoop out the dough and use your hands to roll into 1-inch balls. 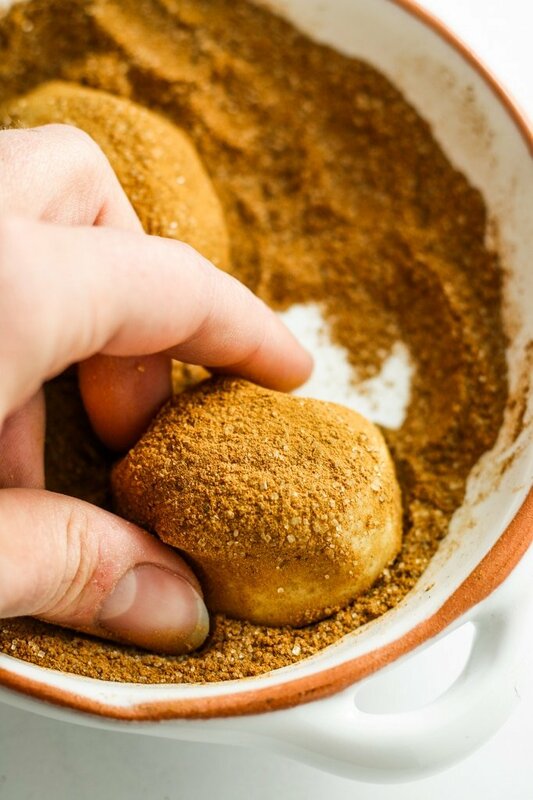 Give each ball a roll in the sugar-cinnamon-nutmeg mixture to lightly coat. Place onto the parchment-lined cookie sheet about 2 inches apart. We were baking these cookies in Colorado Springs, where the altitude is about 6,000 feet. This meant a slightly longer baking time for our cookies than average. I would recommend checking at 8 and 10 minutes for that golden brown color. Okay. 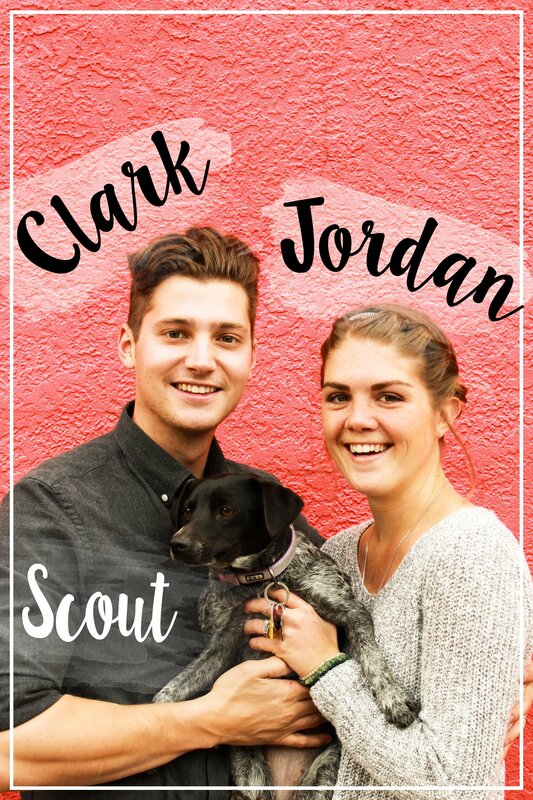 So I try out a lot of gluten free and vegan recipes – most of them turn out okay. Some of them not so great. But THIS RECIPE IS AMAZING. First try I came out with beautiful cookies that were crunchy on the outside and chewy on the inside. Incredible. I even made some substitutions – I used coco oil for the butter, replaced the sugar with coconut sugar, and used flax eggs. Worked out great! I did end up burning a few of them – cooked for ten minutes. Next time I will only cook them for 8. Tomorrow I am going to try making this same recipe as lemon poppyseed cookies rolled in powdered sugar. I think there is great potential here. Love that you offered vegan alternatives. Defo gonna try these bad boys out! They’re just as good vegan! I fell in love with snickerdoodles the first time I made them. These look lovely, can’t wait to try them! You’re a lifesaver with this recipe! I have a Gluten Free friend coming over and I was just looking for a dessert to make. These look wonderful! My stepson is obsessed with snickerdoodles and although I bake a lot, I’ve never made them! 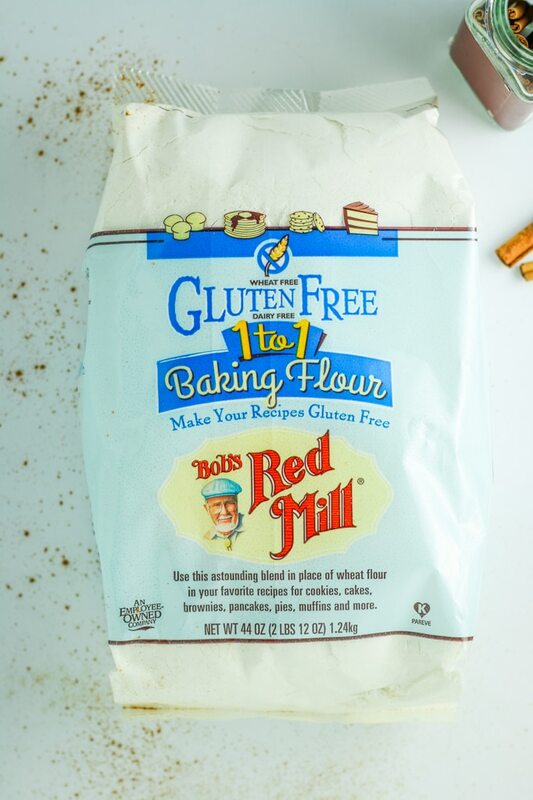 They look amazing and I love Bob’s Red Mill line of products! My go-to gluten-free cookies, since I am Italian, are Amaretti cookies and Brutti ma Buoni cookies. Oooooh I love Amaretti cookies too! I hope you and your family enjoy these snickerdoodles! Your friends will love these! Right?! I’m all about minimal cleanup lol. Enjoy! Right?! I’m all about minimum cleanup whenever possible. Enjoy! These look so good! I have not tried any gluten free cookies. I always wondered what they taste like. Do they taste totally different than regular flour cookies? They don’t taste any different! This particular GF all-purpose flour blend creates the same texture and flavor you would expect from any non-GF flour. These look awesome – and your photos here are gorgeous! I will share this with friend who is gluten free and loves these. This is such a heartwarming story. Bless you and your family. I haven’t made snickerdoodles in such a long time. I’ve been converting a number of recipes to plant-based and look foward to trying this GF version. Thank you foe posting this! We ordered a snickerdoodle latte one morning without really knowing what a snickerdoodle is, now I do! and it looks yummy (so was the latte). I’ve gotta try this and dip it into a regular latte!! WHOA! A snickerdoodle latte sounds amazing! What a beautiful idea, and I love Bobs Red Mill 1 to 1. I’ll definitely have to try these! You should definitely try making these – they’re so delicious! Snickerdoodles are one of my absolutely favorite cookies. Not only to bake, but to eat as well. There is just something about their simple flavor. Great recipe! Oh boy this looks tasty! I know someone who loves snickerdoodles but cant’ eat mine.. I bet she will love these gluten free version. I’m going to make these for her soon. My daughter has Celiac. Am always looking for great GF recipes especially things like cookies and breads since the usual recipes tend to come out tasteless and dry! Can’t wait to surprise her with these! Yay! I’m so glad she’ll be able to enjoy these cookies. Happy baking! Gluten free baking has come such a long way over the last few years. These sound delicious, and would be enjoyed by everyone….GF or not. Heck yes it has! Good options like this flour makes life much easier. I’m so upset that it’s December already, I’ll have to eat a whole box of these by myself. Where did this year go?!?! Hahaha that sounds like my kind of therapy! It absolutely flew by! I love snickerdoodles. It was the first cookie that I made with my grandmother! I love that your version is gluten-free! Yum. I love the Bob Mills brand! I can’t wait to make your cookies. It’s been a while since I made them. Awww that’s such a sweet memory! I love baking cookies with my grandma each year. We usually do sugar cookies! 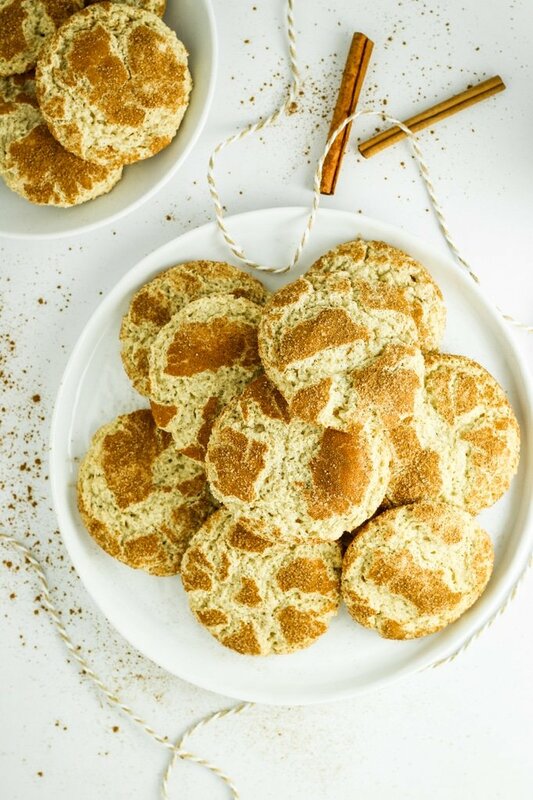 i love these GF flour blend…absolutely love the idea of snickerdoodles. I’ve never heard of snickerdoodles before! Really interested in doing some research now. Thank you for sharing this recipe, guys! I need to bake a batch of these for my gluten free friends. Thanks for sharing! Yum! These look great! I’m a celiac, so I love hoarding any and all gluten free cookies this time of year. I also appreciate that you added the brand of flour you used! They’re all so different, so it’s always nice to know what works in a recipe.